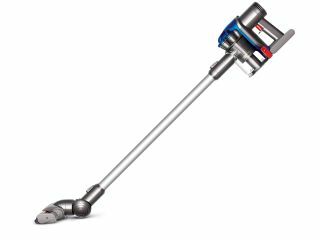 While we rarely get that excited about new developments in domestic cleaning technology, Dyson's latest reinvention of the good old vacuum cleaner certainly caught our eyes this week. This is mainly because James Dyson's latest vacuum cleaner has done away with wires, with the bag and with most of the rest of the appliance as well! Dyson's new Digital Slim vacuum cleaner is totally cordless, being powered by rechargeable batteries that, somewhat strangely, only last for 15 minutes on each charge. (After all, whoever likes to spend more than a quarter of an hour cleaning their house each weekend?). James Dyson claims: "Our digital motor has taken over ten years to develop. Because of its speed – it spins five times faster than a Formula 1 car engine – it can be smaller, stronger and efficient. The digital motor is light, small and powerful, which means DC35 can be light, small and powerful." Despite recently 'restructuring' much of its manufacturing away from the UK to the far east, Dyson also claims to be doubling the number of engineers and scientists in the UK from 350 to 700, the company announced in the launch release for the Dyson Digital Slim. These new UK-based staff include design, mechanical and acoustic engineers, increasing the company's UK staffing level to 1,600, out of 2,500 worldwide. Dyson claims that its digital motors are the fastest, highest power density motors ever developed for domestic appliances, turning at 104,000rpm and making up to 3,300 adjustments each second. The battery-powered Dyson Digital Slim will set you back £199 and will be on sale at http://www.dyson.co.uk/ and The Conran Shop from 4 January 2010.